Gavin Hood (born 12 May 1963) is a South African filmmaker, screenwriter, producer and actor, best known for writing and directing Tsotsi (2005), which won the Academy Award for Best Foreign Language Film. He also directed the films X-Men Origins: Wolverine, Ender's Game and Eye in the Sky. Hood got his start directing when commissioned to make several short educational dramas for the South African Department of Health. His first commercial short film was The Storekeeper (1998). Hood co-produced and wrote the script for his first feature film, A Reasonable Man (1999), which portrays the accidental killing of a young child mistaken for a tokoloshe. He then directed the Polish language 2001 feature film In Desert and Wilderness (W pustyni i w puszczy) when the original director fell ill. This was followed by Tsotsi (2005). Tsotsi won the 2005 Academy Award for Best Foreign Language Film and was nominated for the Golden Globe for Best Foreign Language Film in 2006. 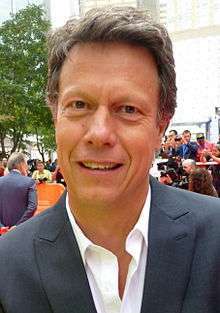 Hood was also nominated for the 2005 Non-European Film—Prix Screen International at the European Film Awards for his work on the film. In 2000, Variety magazine named him as one of its "Ten Directors to Watch". He directed Rendition (2007), his first Hollywood feature, for New Line Cinema. He also directed the film X-Men Origins: Wolverine, based on the Marvel Comics character of the same name, with Hugh Jackman reprising his role from the X-Men films. Any movie that is simply about good versus evil...is in my view putting out into the world and certainly into a mass audience and young audience's mind a rather dangerous philosophy, which is that there is good and evil in the simplistic and easily defined way... I think that for the last eight years, we've had that philosophy very much prevalent in the Bush administration that if you're on the side of good, at least as you perceive it, then you can do no evil...That's what's so great about this character or about this movie for me and why I wanted to do it...This is a guy who recognizes his own capacity for evil and I think that's exciting in a sort of popular culture kind of way. After all, the most famous line from Wolverine, the comics, is "I am the best there is at what I do, but what I do best isn't very nice." In 2011, Hood began work at the helm of novelist Orson Scott Card's Ender's Game. He wrote a draft of Card's screenplay and directed the film. Ender's Game was released in U.S. theaters on 1 November 2013. Hood directed and acted in Eye in the Sky released on September 15, 2015 at the TIFF in Toronto, Canada. Hood also acts occasionally, most notably in In Enemy Hands and the Stargate SG-1 episode "Lockdown". In the early 90's, Hood made notable appearances in two martial arts films shot on location in South Africa. In American Kickboxer, he played the pivotal role of Ken, who is accidentally killed at a party by lead character B.J. Quinn, played by John Barrett. In Kickboxer 5, he played a German kickboxing champion who faces off, and is ultimately killed by the main antagonist Negaal, played by James Ryan. In his 2013 directorial project, Hood appeared as the voice and motion-capture performance of the Giant in the mind game of Ender's Game. In the 2015 film Eye in the Sky, Hood plays Lieutenant Colonel Ed Walsh. ↑ Higgins, Bill (31 January 2000). "'Dance till wee hours". Variety. ↑ Gilstrap, Peter; Fleming, Michael (19 July 2007). "Fox says Hood good for 'Wolverine'". Variety. ↑ "Gavin Hood: Wolverine". SuicideGirls.com. 28 April 2009. Retrieved 2009-04-28. ↑ Zeitchik, Steven (20 September 2010). "Gavin Hood: Enders Game". LA Times. ↑ Gallagher, Brian (28 April 2011). "Ender's Game Lands at Summit Entertainment". MovieWeb.com.